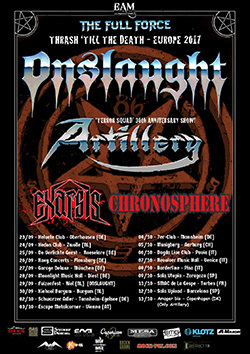 On Sept. 23rd, Artillery will start their co-headline tour with Onslaught. Artillery will celebrate the 30th Anniversary of their Terror Squad album on this run, playing 5-6 songs from that album, plus new songs from their latest album Penalty By Perception, as well as some more classics. See below for dates. Artillery will also tour Denmark in November together with Impalers and with a different setlist – see below for dates!